Taliesin West, Scottsdale, AZ. Courtesy of the Frank Lloyd Wright School of Architecture. The Frank Lloyd Wright School of Architecture is bringing leaders in the design field to each address strands that are moving architecture forward, including: architecture as a mirror, veil, or map for understanding our culture; architecture as the reconstruction of social relations; architecture as formal exploration; architecture as computer-driven exploration of socially fluid spaces; tactical urbanism; architecture as reuse and collage; and architecture as spatial and material composition. In addition to the eight participating architects, the forum will extend through two other scales and types of discussions: evenings with performers, utilizing Taliesin and Taliesin West's array of acoustically tuned and intimate performance spaces; pecha kucha-style presentations by local practitioners and artists; and salons with local cultural leaders. These events will also be documented and disseminated. 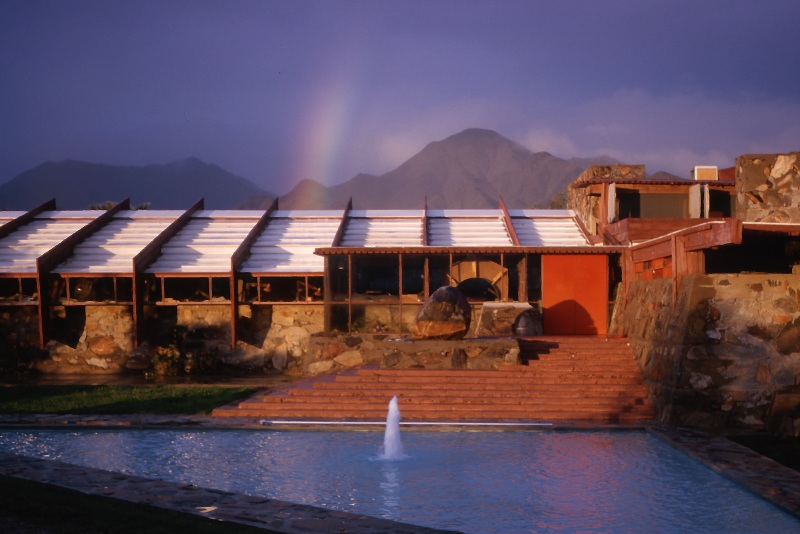 Aaron Betsky, dean of the Frank Lloyd Wright School of Architecture, will be coordinating and organizing the lecture series in conjunction with the Taliesin and Taliesin West faculty and staff. Alfredo Brillembourg and Hubert Klumpner are partners in the Zurich and Sao Paolo-based firm Urban Think Tank. They are also professors at the ETH Zurich. Trained at Columbia University, Klumpner, a native of Austria, and Brillembourg, a native of Venezuela, moved to Caracas in 1992 to begin separate practices, later starting Urban Think Tank (1993) to develop tactics through which architecture could make a critical difference in urban development. Their designs for the Aerial Tramway and Vertical Gymnasium in Caracas became prototypes for the urban interventions they continue to pursue around the world. In 2012, they won the Venice Architecture Biennale’s Golden Lion. Elizabeth Diller and Ricardo Scofidio are partners in the New York-based firm of Diller Scofidio + Renfro. Starting in 1979, with a practice that mixed installation, performance, and public art projects with architecture, their firm gained acclaim for projects such as the Institute of Contemporary Art in Boston, the High Line, and the renovations of and additions to Lincoln Center. They are currently designing a large-scale art venue in New York while also planning the Museum of Modern Art's expansion. Pritzker Award-winner Frank Gehry is one of the most innovative and provocative architects working today. In a career spanning more than five decades, he has continually challenged received notions of architecture, expanding both its building materials (exposed wood studs, chain link fence, lead-coated copper) and its forms. Over the last few decades, he has developed a method of shaping both interior and exterior forms through sculptural techniques he translates into built reality through the use of sophisticated computer modeling technology. Pritzker Award-winner Zaha Hadid is an Iraqi-born architect living and working in London. She first gained a reputation as the producer of some of the most expressive and innovative drawings and paintings in the field of architecture. Her Hong Kong Peak Competition design furthered the ways in which architects understood the relationship of the building to its representation and site. Since then, she has developed a practice that produces fluid forms for public and private clients around the world, which emphasize the need to create an architecture that is open and democratic. Hank Koning and Julie Eizenberg are partners in the Santa Monica, California-based firm of Koning Eizenberg Architects. Born and raised in Melbourne, Australia, Koning and Eizenberg came to Los Angeles to pursue graduate studies at UCLA and stayed to build a practice (1981) that is remarkable in its ability to transform vernacular types and forms into structures that are contemporary, functional, affordable, and sensitive to their settings while producing beautiful interiors. Their ongoing work in affordable housing has been especially notable in offering a quality of habitation that is difficult to find in this sector of construction. Winy Maas is principal and cofounder of the Rotterdam-based firm, MVRDV. After developing a series of computer programs that translated massive amounts of data into three-dimensional form, Maas combined these tools with an approach to architecture that is radical in its stacking and combining of both functions and shapes. Recently, MVRDV has also explored the potential of a “PhotoShop architecture” that results in buildings in which the border between image and form dissolves. Maas also runs the Why Factory, a research and teaching laboratory at the Technical University of Delft. Pritzker Award-winner Thom Mayne is the principal and founder of Morphosis, a Los Angeles-based design studio that has completed projects all over the world. Trained as an urban designer, as well as an architect, Mayne has long explored the landscape of modernism and found ways to articulate forms within that confused environment. He is also cofounder of the Southern California Institute of Architecture (SCI-Arc), the most influential architecture school in the western United States. Tod Williams and Billie Tsien run the New York-based firm of Williams/Tsien. Their work distinguishes itself through its focus on materials and detailing, as well as through dramatic sequence of exterior and interior spaces. Through their attention to the physical texture and connections at the heart of buildings, they have managed to create complex and layered structures for private homes, college dormitories, museums, and office buildings. They are currently designing the new American Embassy in Mexico City, Mexico. Founded by Frank Lloyd Wright over seventy years ago as an architecture apprenticeship program, the Frank Lloyd Wright School of Architecture is one of the oldest continually operating architecture schools in the United Stated and has been accredited since 1985. Evolving from Frank Lloyd Wright's concepts of organic architecture, the School teaches a design process that unfolds out of existing cultural and physical conditions, materials, and landscapes into well-crafted frameworks for human activities.